Single Fix Base Plate Compatible with all types of Unistrut Channel Heavy Duty - 5.. Double Fix Base Plate Mild Steel - 5mm Thickness 14mm Holes Hot Dipped Galvanised - (HDG) .. Double Channel Base Plate Mild Steel - 5mm Thick Plate Hot Dipped Galvanised - (HDG) Compat.. 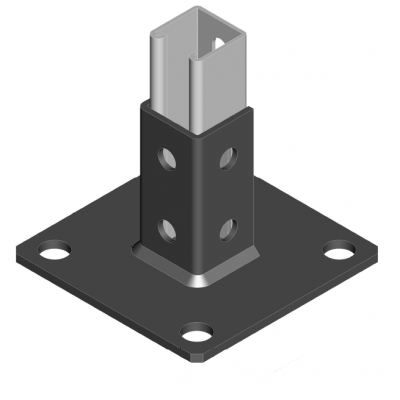 Single Gusset Base Plate Also known as "Single Gusset Delta Plate" Mild Steel - 5mm Thickne.. Double Gusset Base Plate Also known as a: 'Double Gusset Delta Plate' Mild Steel - 5mm Thic..
XL Single Channel Base Plate Mild Steel - 5mm Thick Plate Hot Dipped Galvanised - (HDG) C..
XL Double Channel Base Plate Mild Steel - 5mm Thick Plate Hot Dipped Galvanised - (HDG) C..